Tank & Pants : Avenue. Jacket: Macy's. Flats: Barefoottess.com. Clutch: Ola & Earrings (Me). 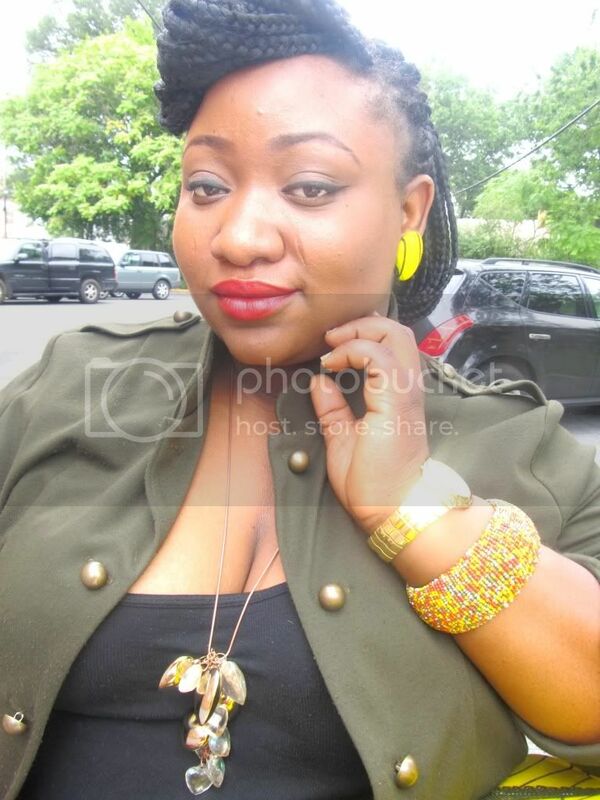 Bracelets & Necklace: Ashley Stewart. Ring: Sights & Sounds. 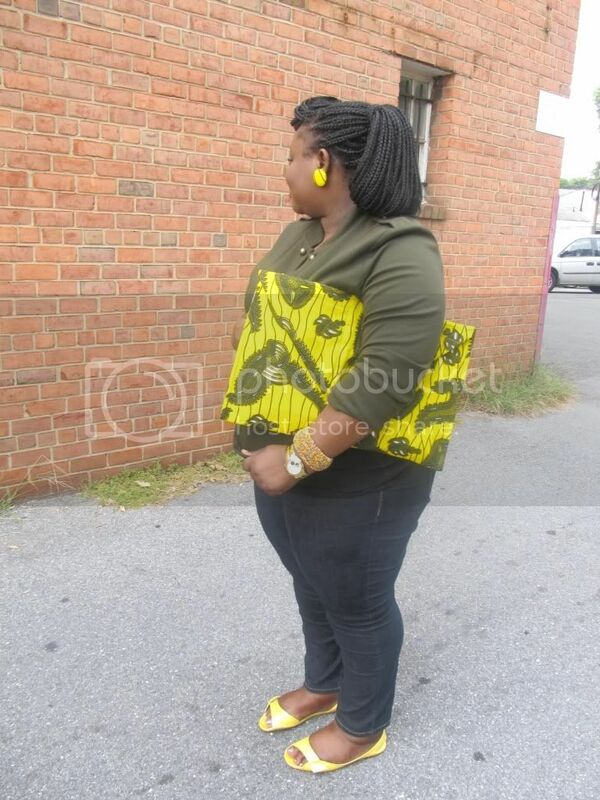 So, i love me a good looking oversized clutch and i decided to make one using some left over Nigerian fabric also called an ankara. i decided to make mine really oversized because i wanted something huge. I also made some large button earrings using this same fabric. I wore this outfit to school today and i decided to keep it simple with a pair of flats and a military jacket. 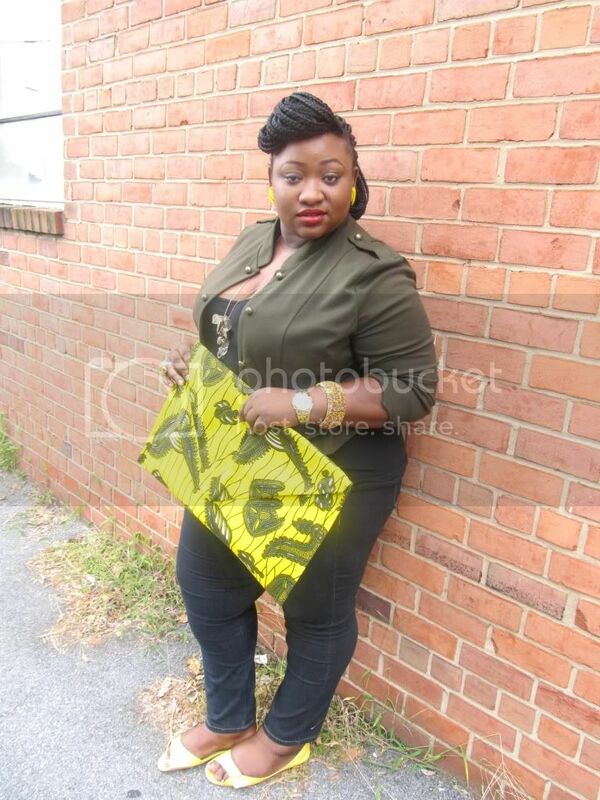 :O the clutch, the clutch honey is just giving me all kinds of life. I love the whole outfit. work! Ooh man the clutch the amazing fabulous clutch!!!!! I need to make some I've had some ideas floating around in my head but I haven't dragged myself to do it you have given me some motivation! Also I am wishin' that I looked this pulled together when I go to school but this semester I have art classes that=no fancy-ish clothes... But seriously you look wonderful! your hair & the clutch...I LOVE IT!!! 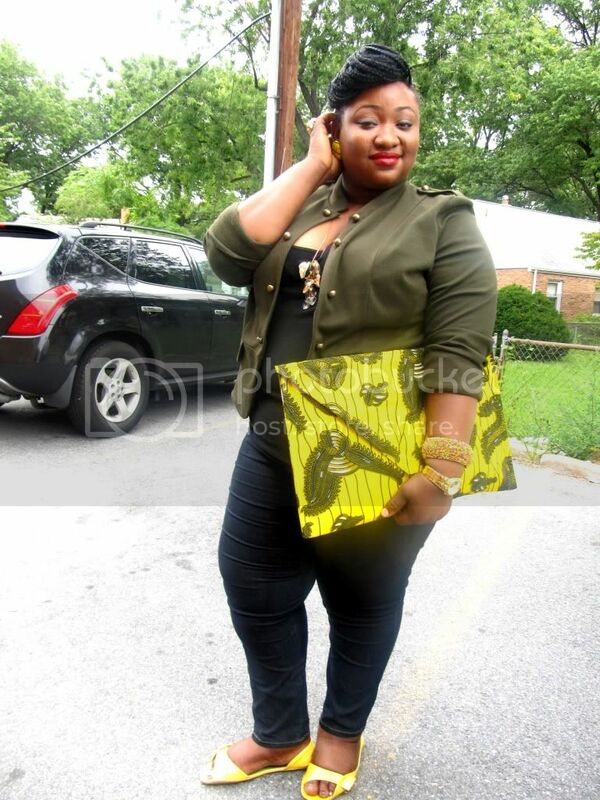 Wow, now that is an oversized clutch! I love that you made matching earrings, so unique! Love the clutch and the earrings! I have that jacket but in black!!! You look amazing!!!! I'm so glad I ran across your blog you have such uber fab style!!! 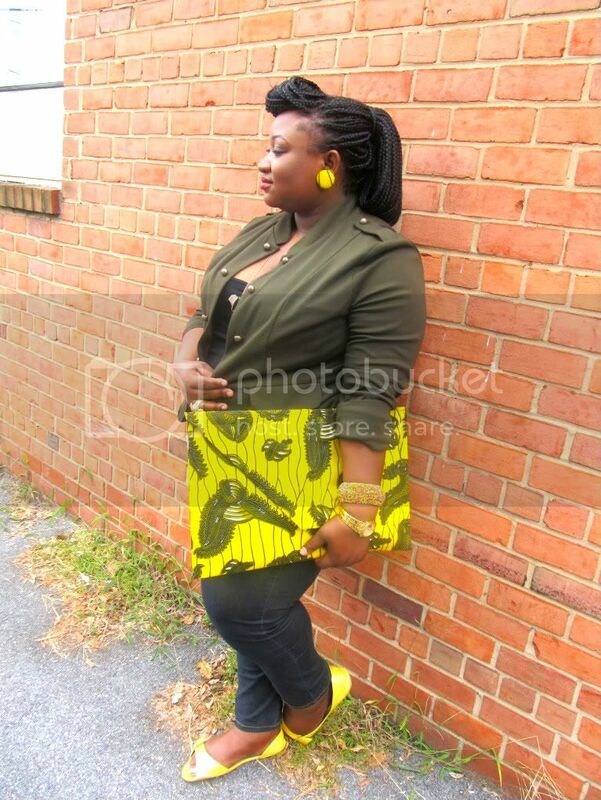 That DIY clutch gives me some inspiration for a couple of DIY fashion projects I've been neglecting. I'm now following you with GFC! 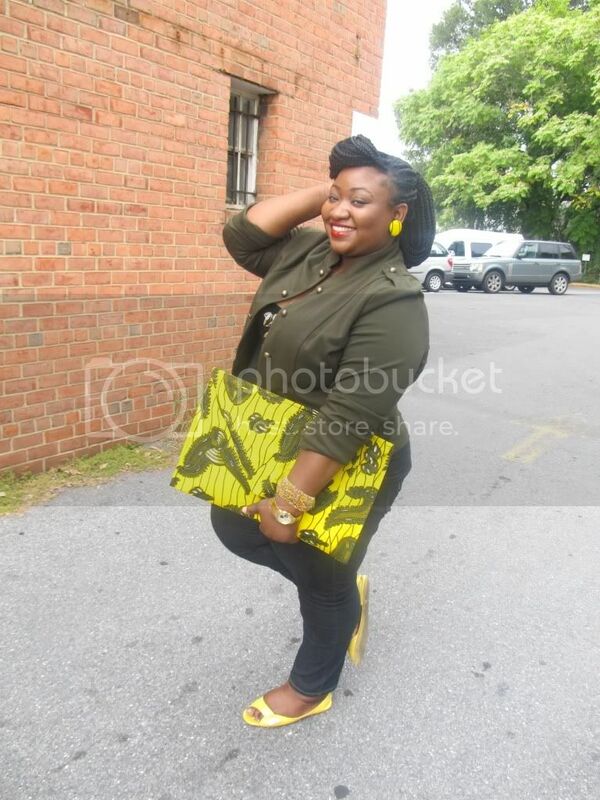 Love this clutch, and Love yellow i'm totally jealous girl! I like the colour combinations. I am not very comfortable wearing yellow but your accessories make me yeasy to!!! I love bright colors! Those earrings are sooooo cute! I recently came across your blog any I'm so into your clutch!! I hope I can fine one here in Manila, too! I hope ou can visit my blog when you have the time! Kisses! You look amazing and I love your hair. 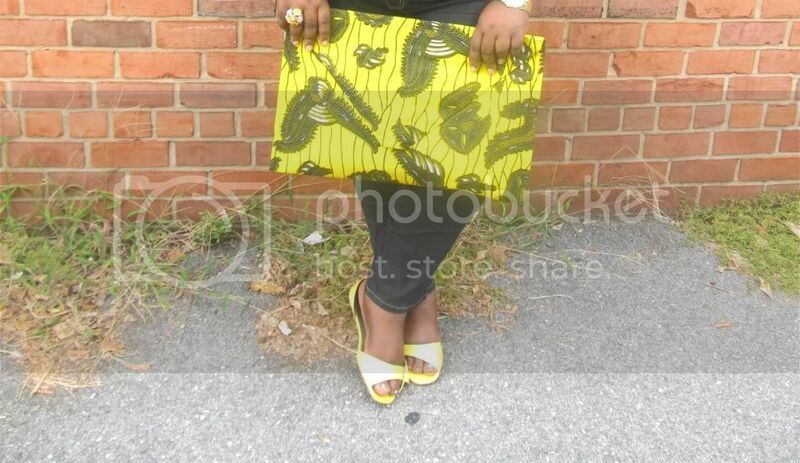 I need that clutch in my life! I can see myself making so many of these with my Mom's old wrappers. Can I ask what you used to give it that shape? Thanks! That clutch is awesome! And the suicide roll in your hair tops off your rockabilly look. Beautiful! 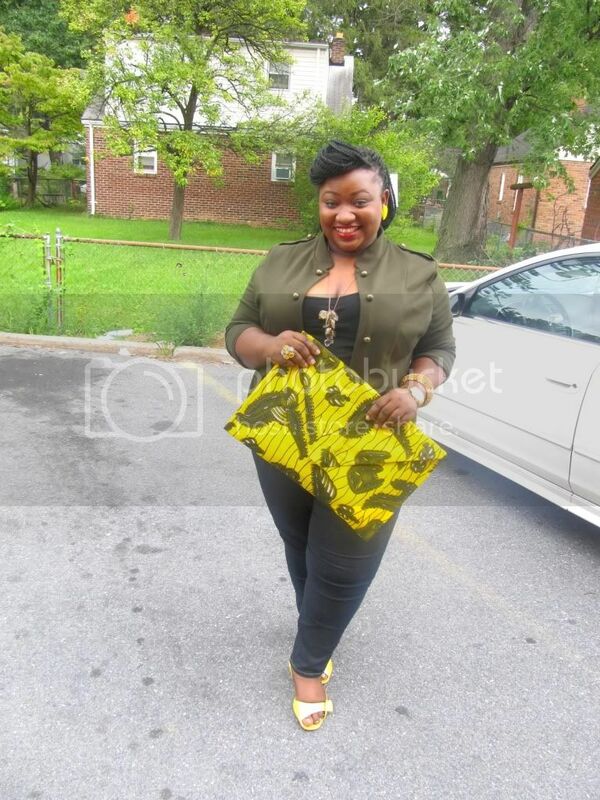 Lets start with the clutch bag....awesome,love the size,the print..everything about it...then the military jacket...stylish...and your hair...fab!!!! YESS! You look great. I want that clutch! and your jacket. Super cute, I love that color pop! Meanwhile, really like how you styled your braids. You are sooooooooooo pretty. I love your oversize clutch and the way you do your hair...Fantasti!!! Ok..when your done with that clutch..go ahead and send it my way!! I absolutely LOVE it! The print and color is like POW!! Wow that clutch is so amazing!! Want it! The clutch! Yes! Love it! You should give us a step by step tutorial!